The vast majority of Rand’s iconic ads feature a photorealistic reproduction of the specific cigar model against a white ground with sketchy, hand-drawn elements, but this design for a poster, likely dating from a seasonal variation of the campaign that ran in 1953, has a more graphic approach. Rand has reduced the elements of the scene to silhouettes and flat planes of color. 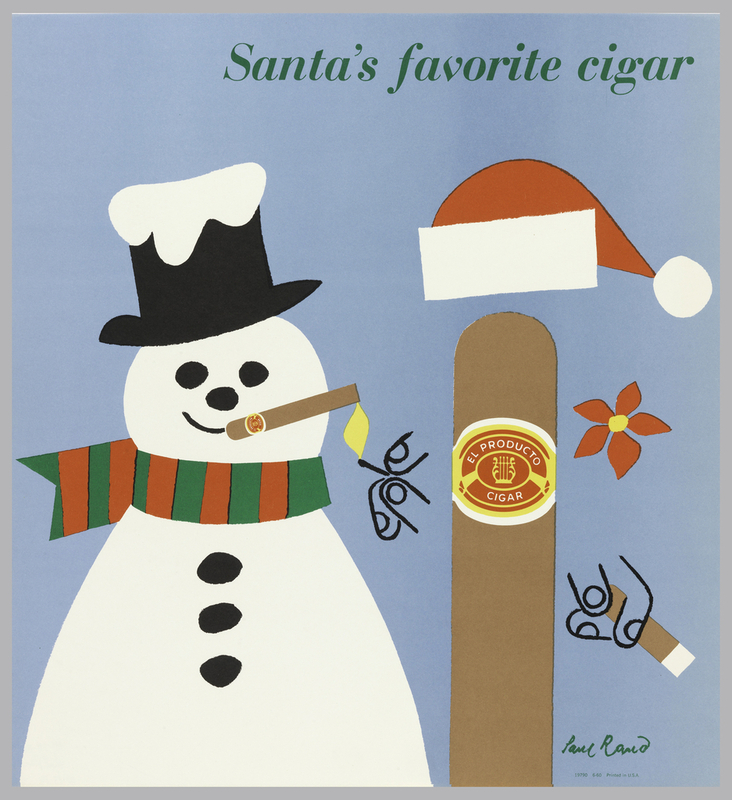 The El Producto cigar, a festive Santa hat and poinsettia blossom supplanting its traditional trimmings, is now depicted as a flat-brown column, while the figure of Frosty the Snowman, whose cigar “Santa” lights, resembles a child’s paper cut-out. The new style of the advertisement and the tongue-in-cheek scene would have set El Producto’s ads (and by extension their product) apart from their main competitor Dutch Masters, who ran a more traditional representational campaign throughout the 1950s. Heller, Steven and Jessica Helfand. Paul Rand. London: Phaidon, 1999.